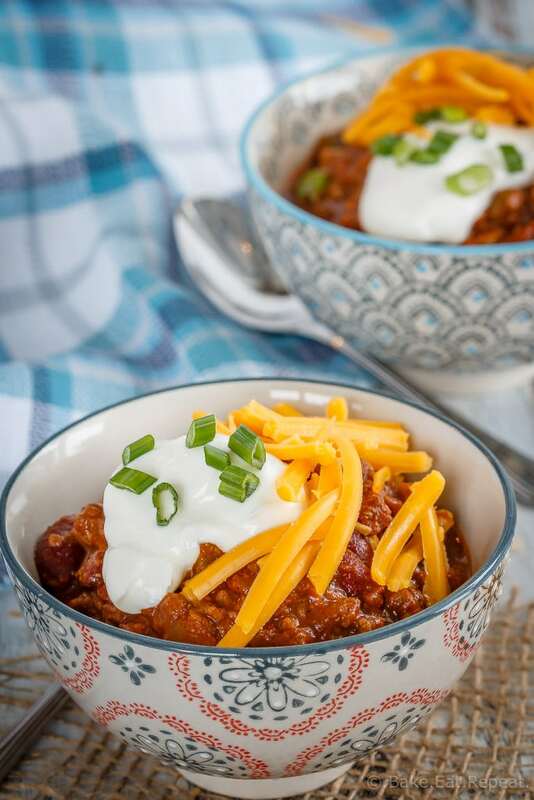 This slow cooker chili is super quick and easy to throw together and makes the perfect warming meal for these cold winter evenings! I’ve never been the biggest chili fan. It’s always been one of those meals that I’ll eat if put in front of me, but probably wouldn’t bother with the effort of making. 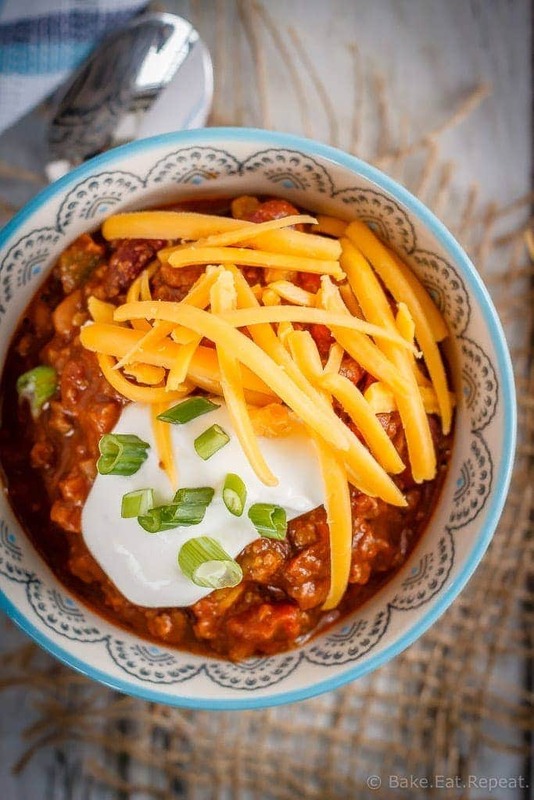 I’m changing my mind on that now that I have this easy as can be, slow cooker chili recipe. It’s so fast and easy to get into the slow cooker, and then it just happily cooks away until you’re ready to eat, with no more extra effort from you. Unless you decide to make some of these amazing buttermilk biscuits (or these super easy cream biscuits) to go with it. Not necessary at all – but I would definitely recommend it. Chili is one of those meals that calls for homemade biscuits I think. This slow cooker chili is a bit spicy but not terribly so. And you could definitely modify that fairly easily if you want a milder (or spicier) chili. I think the other reason that I never loved chili before is that I didn’t know about toppings. Evidently I’ve been living under a rock, but I had never put sour cream and cheddar cheese and green onions on my chili until very recently. Can I just say that toppings make it so much better? I’ve been missing out. 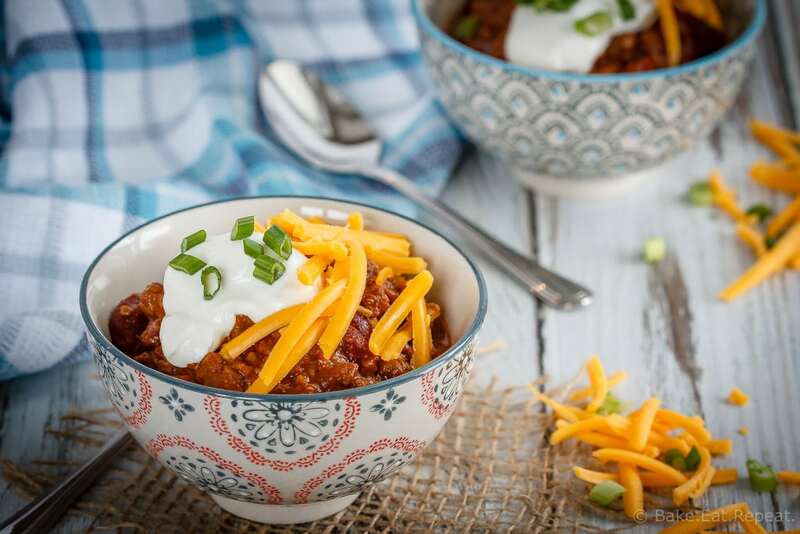 Don’t be like me – load up the toppings and enjoy this easy slow cooker chili! I’ve also shared this recipe over on The Weary Chef. In a large skillet, heat the olive oil over medium heat. Add the onion, garlic and bell pepper and cook, stirring, for 2-3 minutes or until softened. Add the chorizo sausage (squeeze the meat out of it’s casing) and the ground beef and cook, breaking up the meat as it browns, until no pink remains. Drain the grease and transfer the meat to a 5-6 quart slow cooker. Add the chili powder, cocoa powder, cumin, tomatoes, kidney beans, brown beans and salsa and stir to combine. Add salt and pepper to taste. Cook on low for 6-8 hours. Serve the chili with whatever toppings you like. Leftover chili reheats well in the microwave. If you don’t like (or can’t find) chorizo sausage, Italian sausage works well here too. If the chorizo sausage you have is already fully cooked, chop it up in small pieces instead of removing it from it’s casings and add it to the pan after the ground beef is browned. Source: Adapted slightly from Best of Bridge .